Newsletter: HOT TOPIC: Consumer Nation: Can Confidence Drive the Economy? : HOT TOPIC: Consumer Nation: Can Confidence Drive the Economy? Consumer Nation: Can Confidence Drive the Economy? Confidence dropped slightly in November, but remained at elevated levels not seen since the dot.com boom.3 However, all three major stock market indexes fell into negative territory for the year on November 20.4 So it’s uncertain how long consumers will remain unruffled by market volatility. The Consumer Confidence Index is derived from a questionnaire sent each month to more than 3,000 U.S. households. The survey asks consumers to rate current business and employment conditions in their regions and expectations for future conditions (six months hence) for business, employment, and household income. It also asks about plans for major purchases, but these responses are not included in calculating the index. The University of Michigan Index is derived from three more detailed surveys that go to a smaller set of consumers and ask questions about overall economic conditions, personal finance, and buying intentions. Some economists consider consumer confidence to be a lagging economic indicator, because consumer attitudes tend to change more slowly than the broader economy. On the other hand, consumer expectations for the future are a leading indicator that may help predict future economic direction. When consumer confidence leads to higher spending, it typically propels corporate revenues, which may prompt businesses to invest in expansion, hire more employees, and/or raise wages. Businesses have been slow to invest and raise wages, but the recent numbers for unemployment, job openings, and wage increases suggest that the economy may have reached a tipping point. 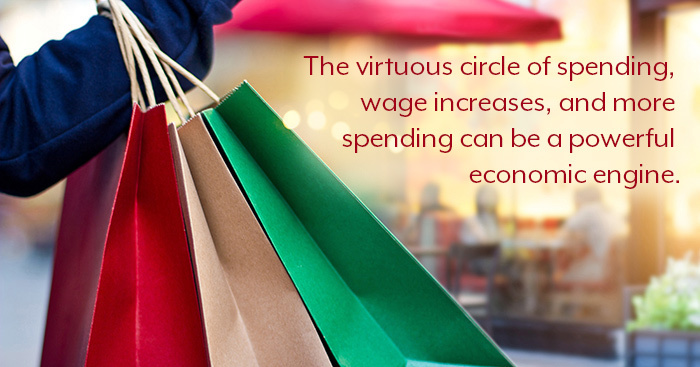 If so, the virtuous circle of spending, wage increases, and more spending can be a powerful economic engine. It remains to be seen whether consumer confidence will be strong enough to push through these headwinds. To some extent, that may depend on whether wage increases continue to outpace inflation. For now, confident consumers are one of the greatest strengths of the U.S. economy. All investments are subject to market fluctuation, risk, and loss of principal. When sold, investments may be worth more or less than their original cost. Securities offered through LPL Financial, member FINRA/SIPC. Investment advice offered through Independent Financial Partners (IFP), DBA Summit Wealth Advisors, LLC, a Registered Investment Advisor. IFP and Summit Wealth Advisors, LLC are not owned or controlled by LPL Financial. The LPL Financial Registered Representatives associated with this site may only discuss and/or transact securities business with residents of the following states: AK, AZ, CO, FL, KS, MA, MN, OH, OR, NV, PA, TX, WA.